It’s been months in the making, but I am excited to share that my master bathroom renovation is complete. I actually wrapped it up right before the new year hit, but I was awaiting a few accessory items (the finishing layers always make complete a space) + I really wanted to use the space on a daily basis before sharing my thoughts on the outcome. I don’t know who in their right mind would find this shade of purple to be pleasant each day, but it wasn’t for me. If you can believe it, this space ended up being the last of all the rooms to be renovated (why did I wait so long?). Finally in 2011, we gave the bathroom a DIY overhaul with a new floor (groutable luxury vinyl tile, tutorial here), new paint on the walls, new paint on the cabinet (faux glaze tutorial here), and new accessories (like the shower curtain made using window drapery panels, tutorial here). What a huge difference. We loved it. Fast forward 6 years, and we were in want + need of a total bathroom overhaul. 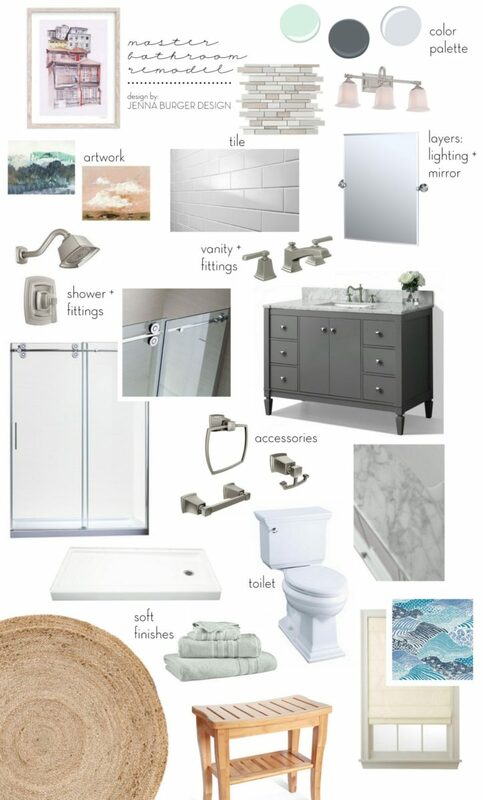 I envisioned a large shower, a longer + newer vanity + tile! 3 walls now are floor to ceiling tile and this space feels (and looks) like a high-end hotel bathroom with a serene spa feel. 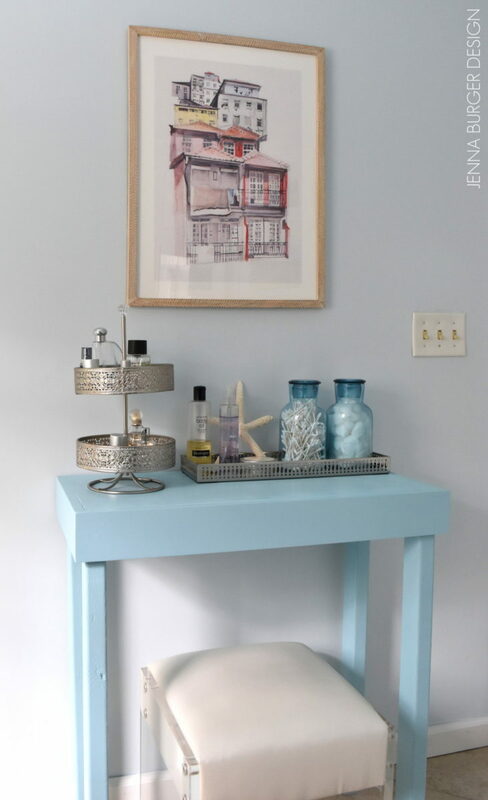 If you know me, I adore color, but for this space, I stayed with lighter + brighter hues of neutrals and added contrast with a dark gray cabinet + layers of accessories in shades of blue. 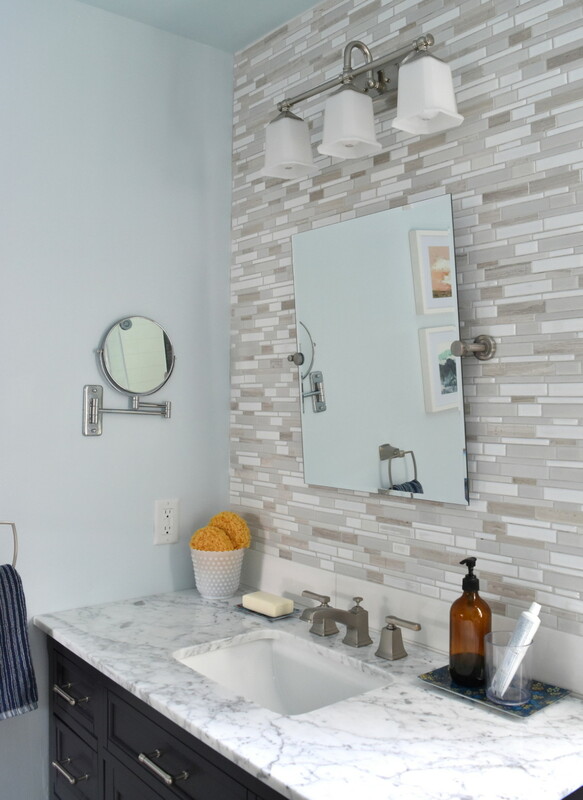 The paint color for the space was tricky… I actually had another color chosen but because the tile above the vanity is glossy & reflective, the tile took on an ugly color. So I went to the light section of the color wheel and choose a soft blue. 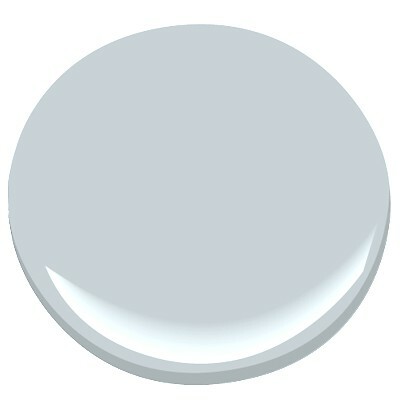 It’s called Sunday Sky by Valspar. 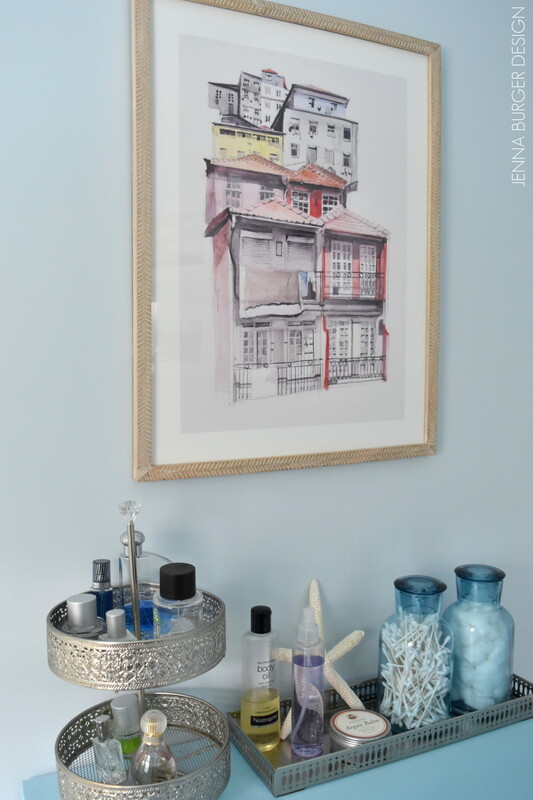 Because of the small amount of wall space, I decided to paint the ceiling a color as well and chose a slightly darker shade of blue (in the same color family as the walls). 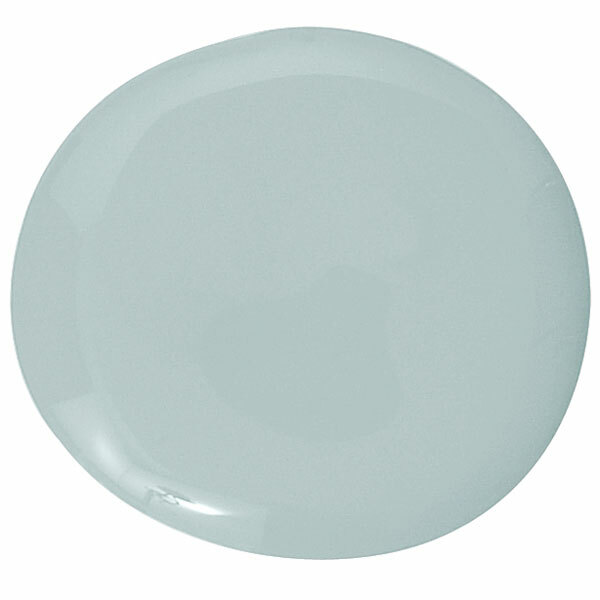 It’s called Windblown Blue by Valspar. 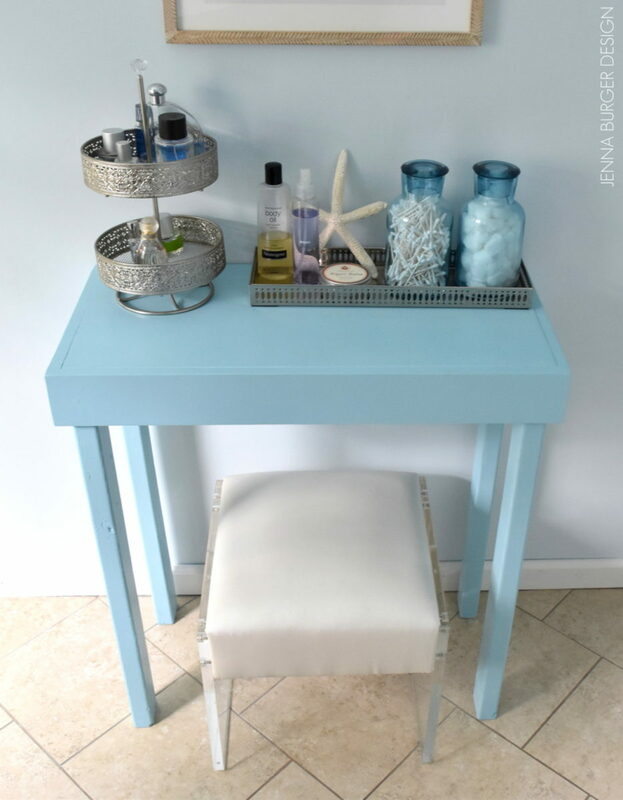 The previous vanity was only 36″, but there was plenty of space to install a longer vanity. We were able to increase the the size to this 48″ wide vanity that has two doors in the center and 3 drawers on each side (it looks like 4 drawers, but the bottom 2 are actually one taller compartment). 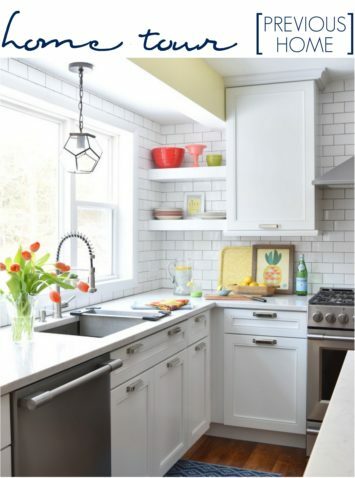 The additional 12″+ has been a game changer with the amount of usable counter space. Yes, a double sink would have been glorious, but I’ll take what I can get! Having drawers in the bathroom has also has been a welcomed change. There is now so much room for the smaller bathroom items, as well as taller items like hairspray and nailpolish remover. 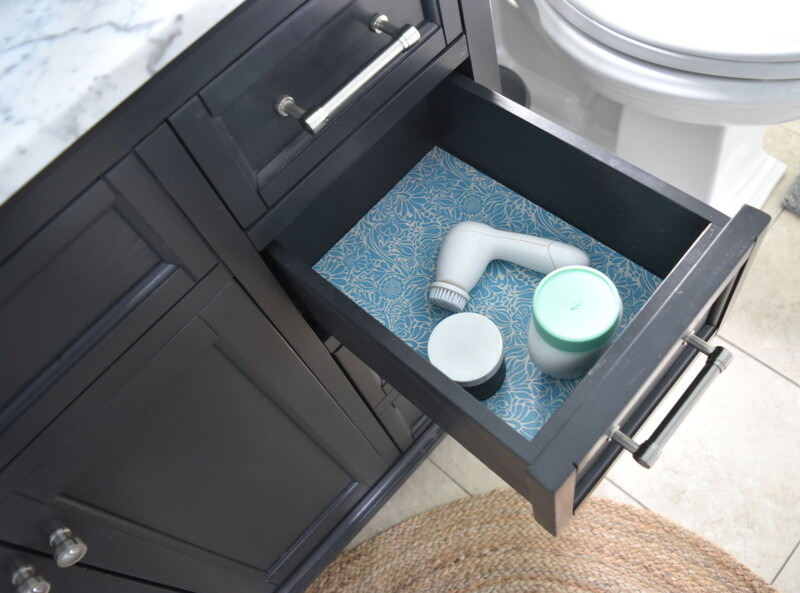 I lined the drawers with this cute contact paper that I snagged from Target for $3. Just a small touch that makes a big difference. 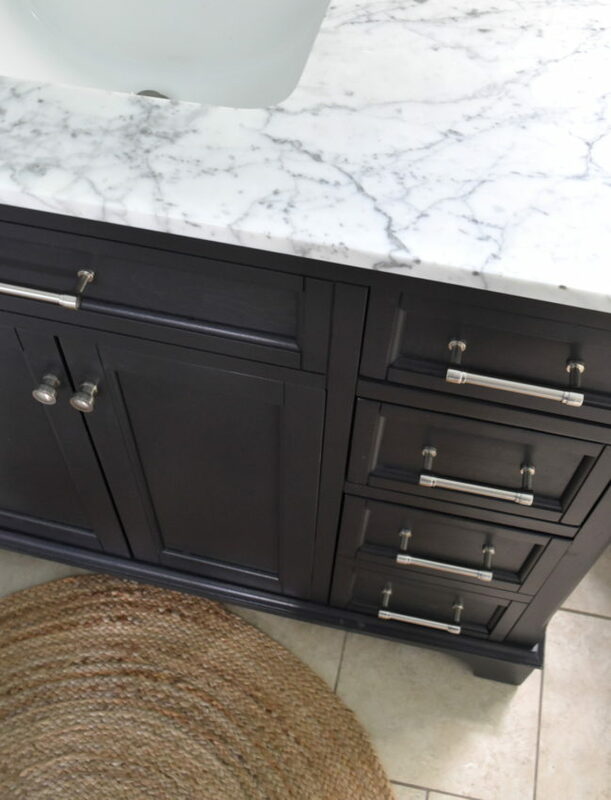 The countertop for this vanity is a beautiful carrara marble. Never great for the kitchen, but perfect for the bathroom! 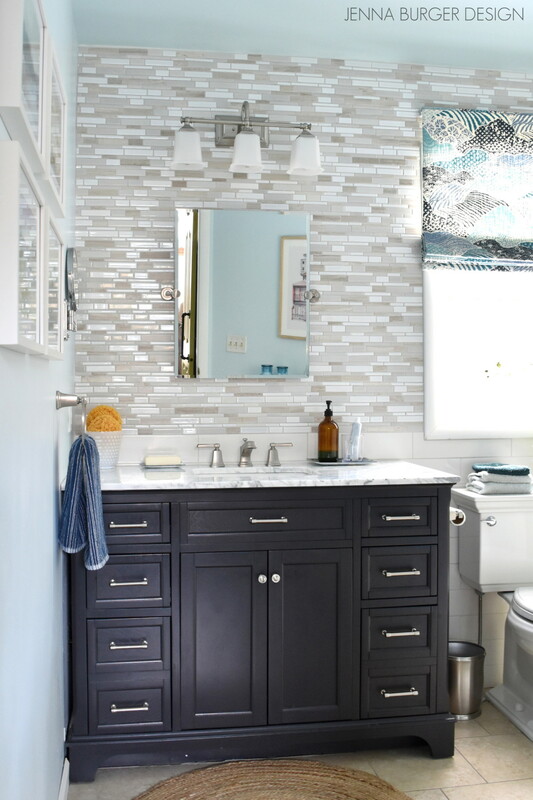 This vanity came with the marble top + undermount sink in a square shape. A 36″ round jute rug placed in the front of the vanity has been such a nice added touch for softness and texture. 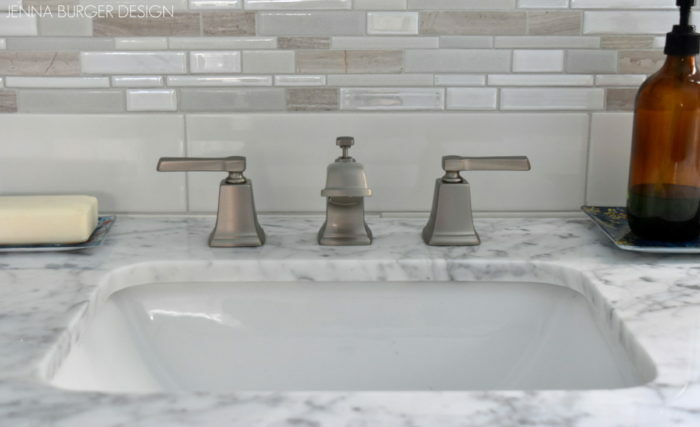 The marble countertop arrived with 3 holes to accommodate this widespread sink faucet. When possible, I always prefer separate holes for the faucet + handles versus being together on one late. The look is higher end and appears like it was custom cut. 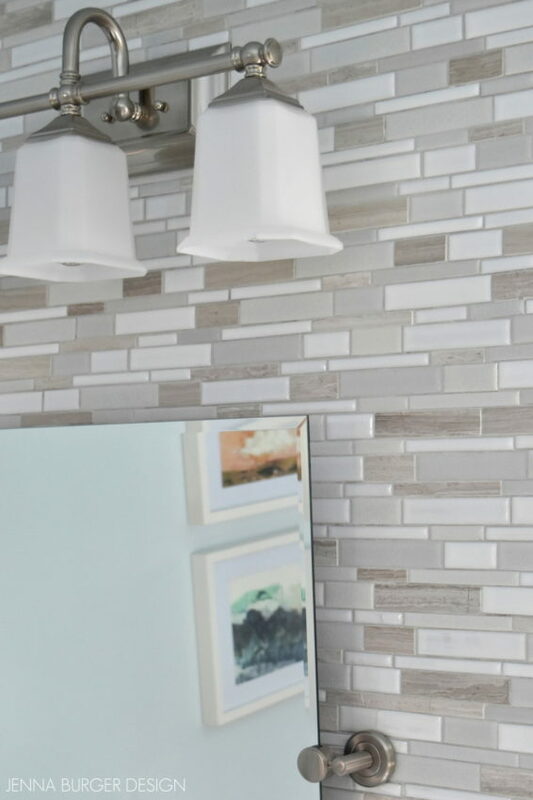 The frameless tile mirror above is a favorite of mine not only because it’s affordable at less than $100, but also because it’s a sophisticated, classic look + it can accommodate people of different heights since it tilts. 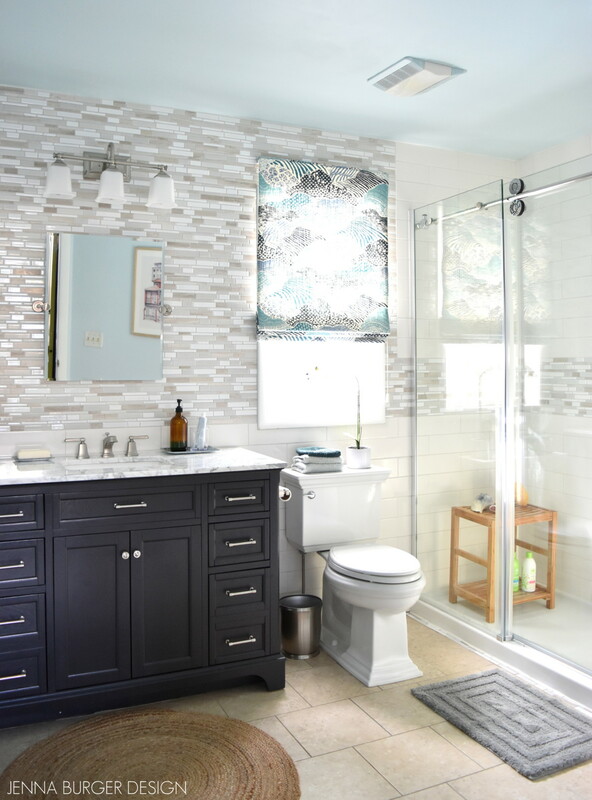 I have to talk about the tile… The tile is what truly sets this bathroom apart and gives the space a custom, unique look! The tile in the shower space is a 4 x 12 white subway tile and I added a 12″ high band about 3′ high above the floor, which continues to the ceiling on the wall of the vanity. 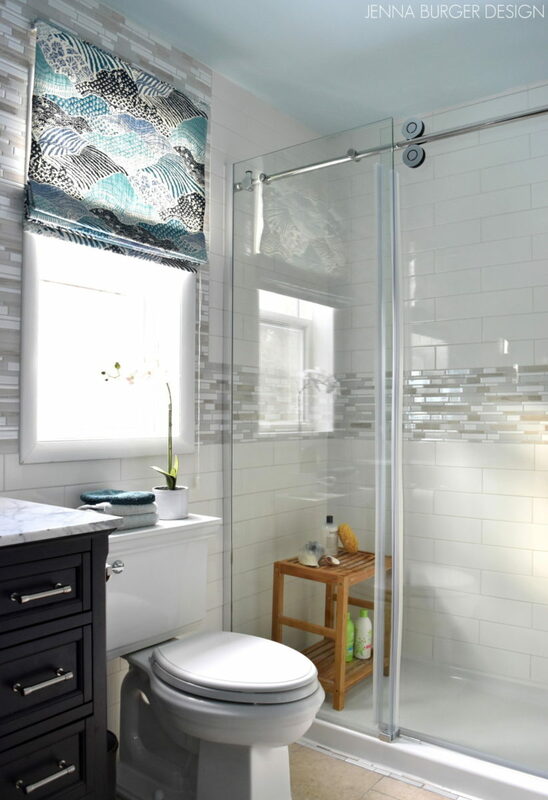 The accent mosaic tile (which comes on a 12″ x 12″ mesh sheet backing) is made of a variety of ceramic + natural stones in varying shades of neutrals. It is such a beautiful backdrop to the vanity and is so dramatic, but not in an overwhelming way, when you enter the space. 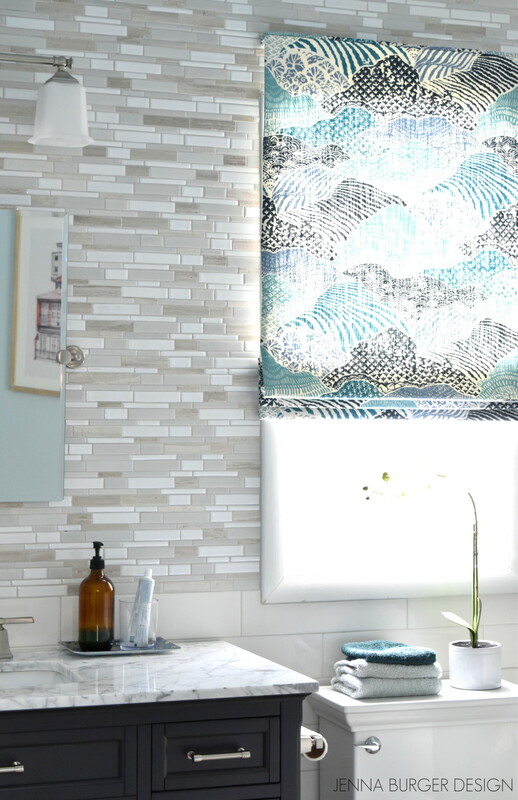 As you make your way around the space, the window adorns a new roman shade made by my go-to-fabricator Tonic Living. 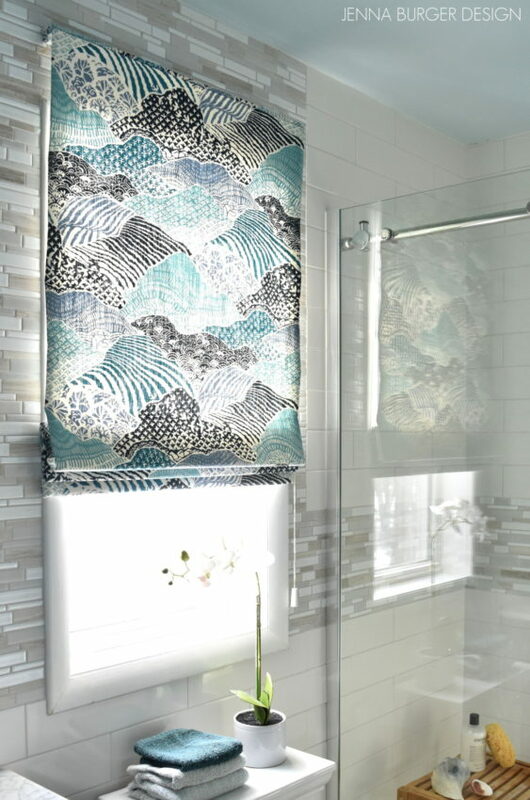 I work with them a lot on client projects and they create such gorgeous window treatments. 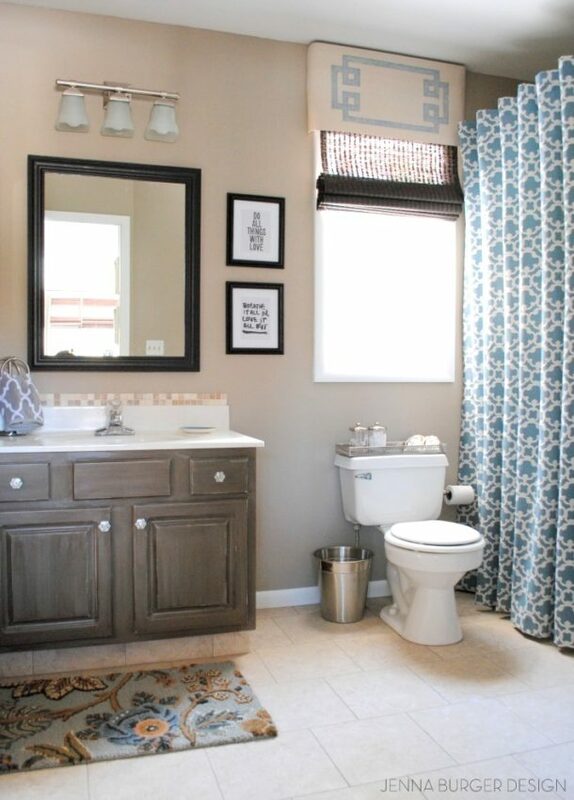 This fabric just truly captures everything that I wanted this bathroom to evoke. 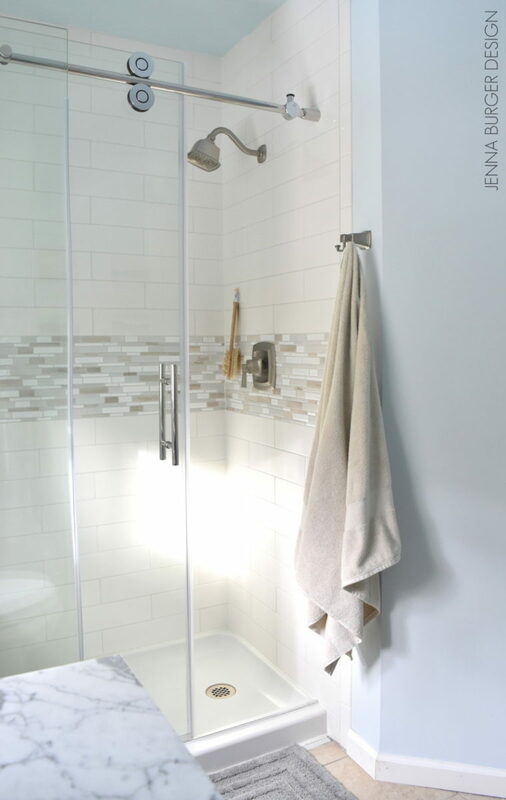 One large component of this bathroom remodel was the removal of the existing tub and creating a shower space in it’s place. This renovation was part DIY and part highered out to a contractor. There were areas (mainly plumbing) that was beyond our skillset to take on, so calling in a contractor was a must. 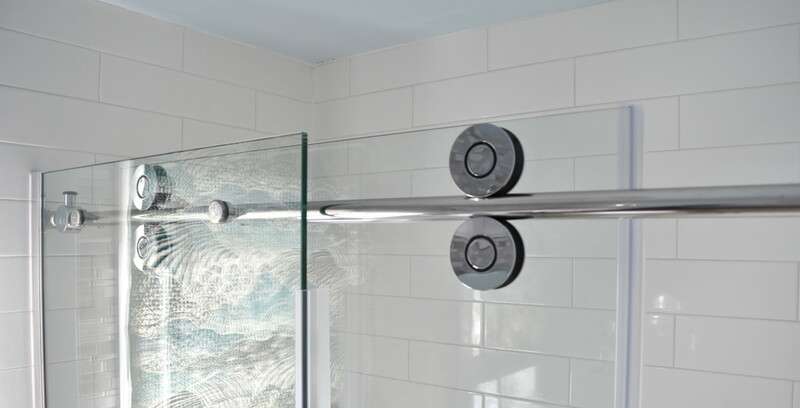 Once he removed the existing shower unit, he installed a new shower pan. 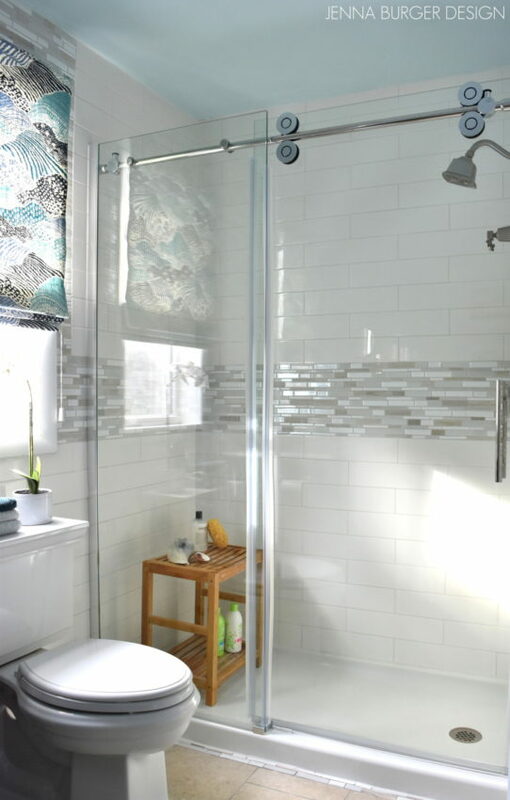 We installed the tile on the walls, and then he returned and installed the new shower enclosure. One moment it was a problem, the next a simple resolution was discovered! I am really loving this shower door because it eliminates the difficulties of a typical swinging shower door (they swing into the shower so the placement for the shower fittings needs to be configured properly) + the design of it is so modern + minimal. The one panel is stationery (left side in the picture above) and the panel with the handle is operable. The wheels seamlessly roll on the bar above similar to a rolling barn door. 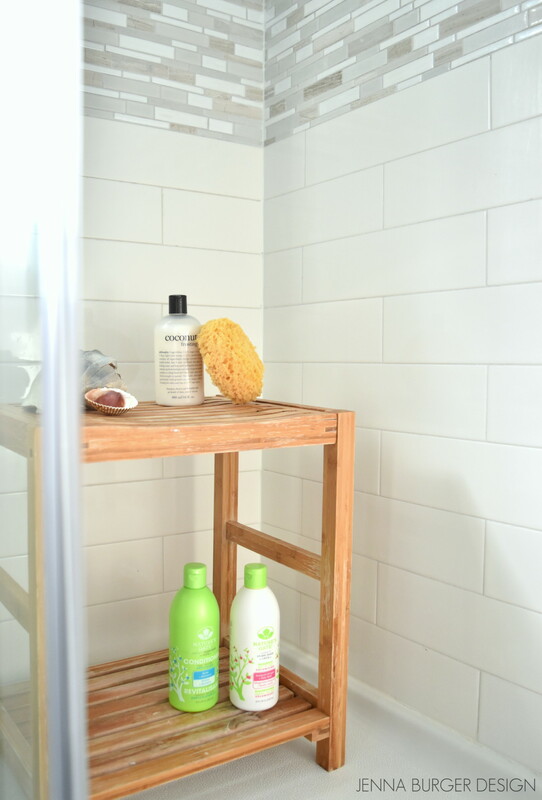 In lieu of a bench or built-in niche for shampoo (something I would have loved, but beyond my skillset + budget), I found a petite teak bench perfect for sitting and/or holding various shower necessities. 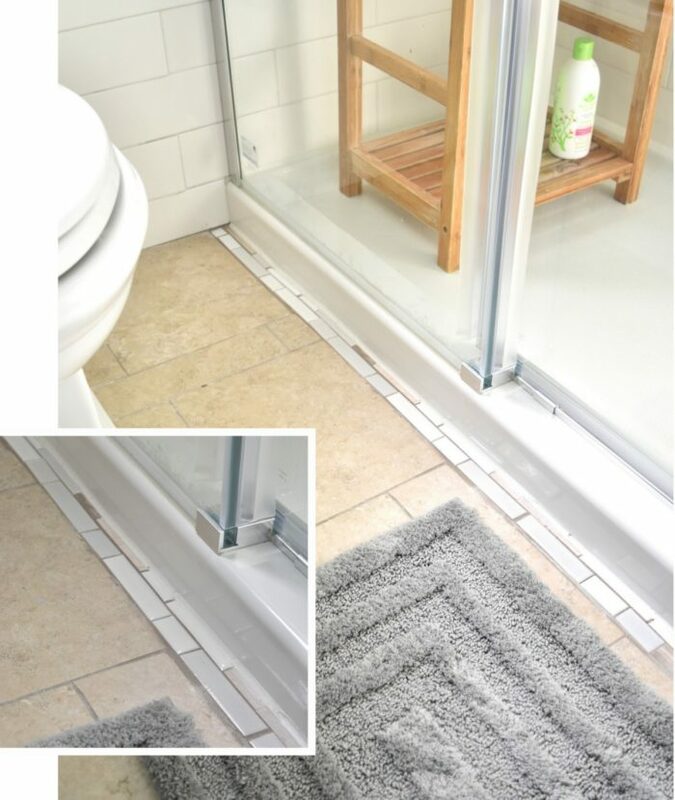 To finish off the tile where the tile meets the wall on the shower fittings side, I added a 3×6 bullnose tile in a vertical layout. With the one side of the tile being curved, it transitions beautifully into the wall. 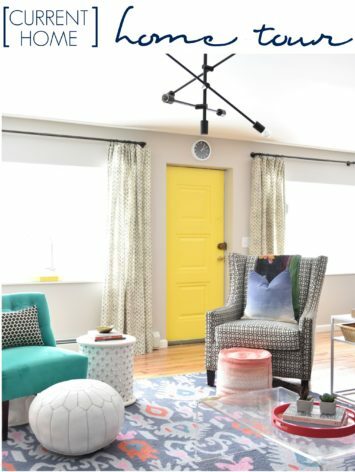 The layout of this space is somewhat tricky because there is an angled wall that is too large to leave bare, but too small to add a piece of furniture that is oversized. When I was scouring for accessories, I knew what I wanted, but couldn’t find anything that was just right + within my budget. 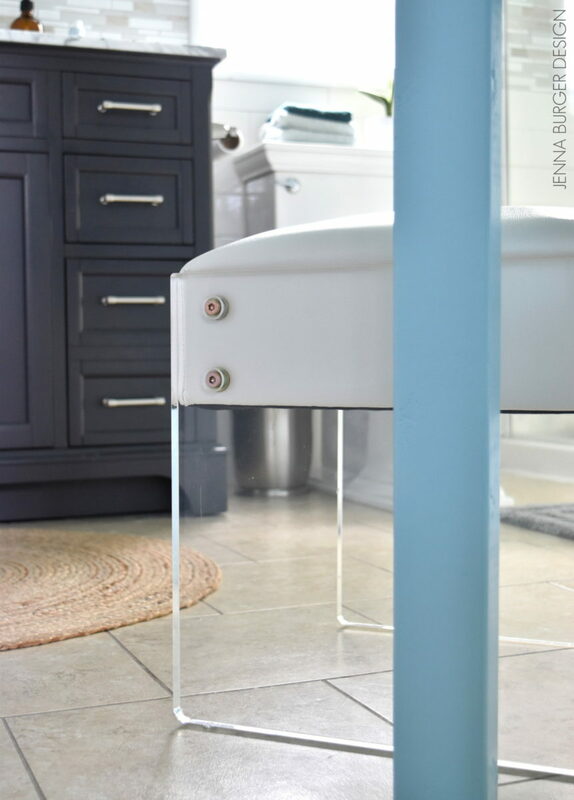 In the end, I found this gorgeous lucite + leather (white) stool. I just couldn’t leave it. I knew I had to pair it with a simple + minimal vanity. Shopping came to a halt because I decided to build the simple vanity that I envisioned. 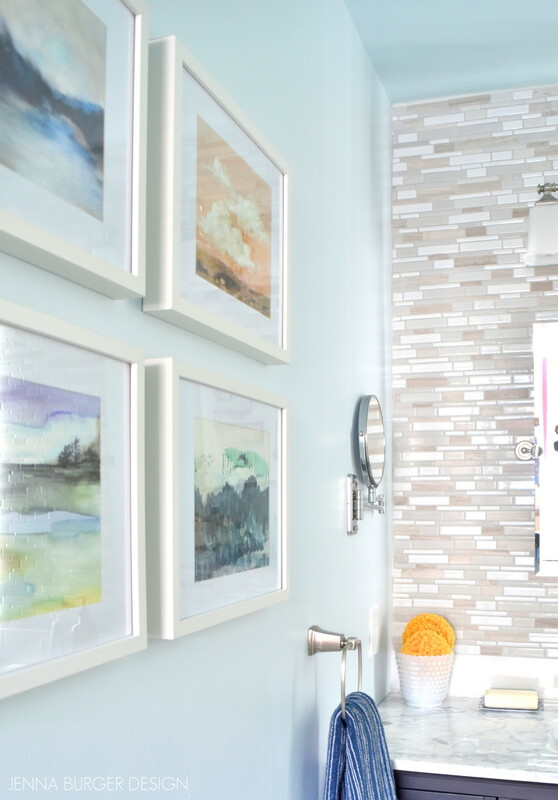 All the beautiful artwork in the bathroom is from Minted.com. They are a fabulous source for fine art + limited edition prints at an affordable price. One of the most frequent inquiries I get on the blog is about the towel bars mounted on the back of the door. 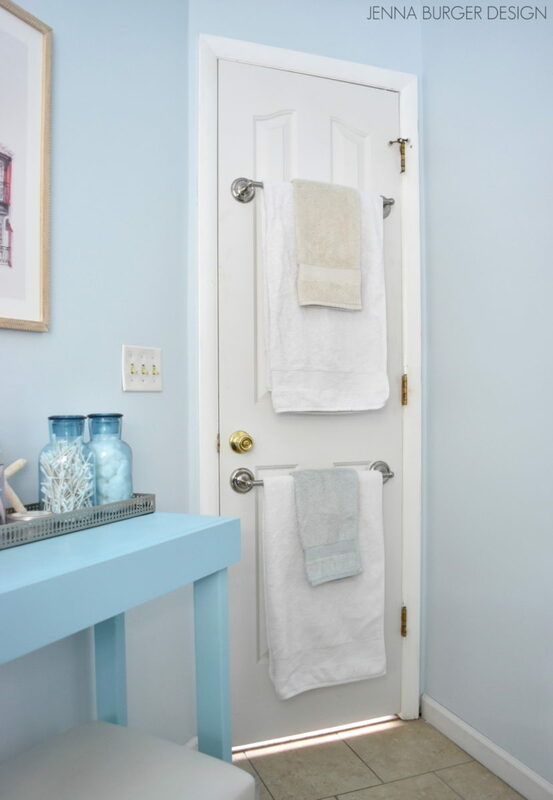 The bathroom space is decent, but there is no perfect place for towel bars, so the existing back-of-the-door-towel-bars remained. 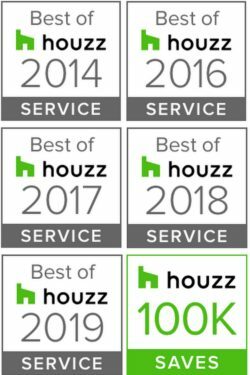 Like all renovations, this project came with it’s hurdles + challenges, but nothing that couldn’t be overcome with thinking outside the box and a bit of patience. As with all projects, there is a first for everything and with each completed endeavour, I take away something new, which builds my skillset + confidence. At the same time, I know when to turn to others and call in the pros. 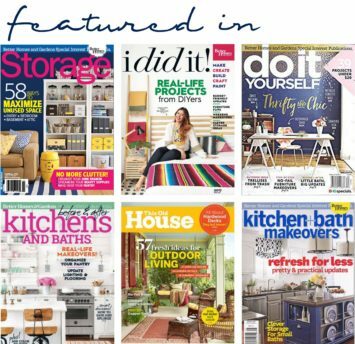 Now through March 23, Lowe’s is having a kitchen + bath event with deals up to 40% off. 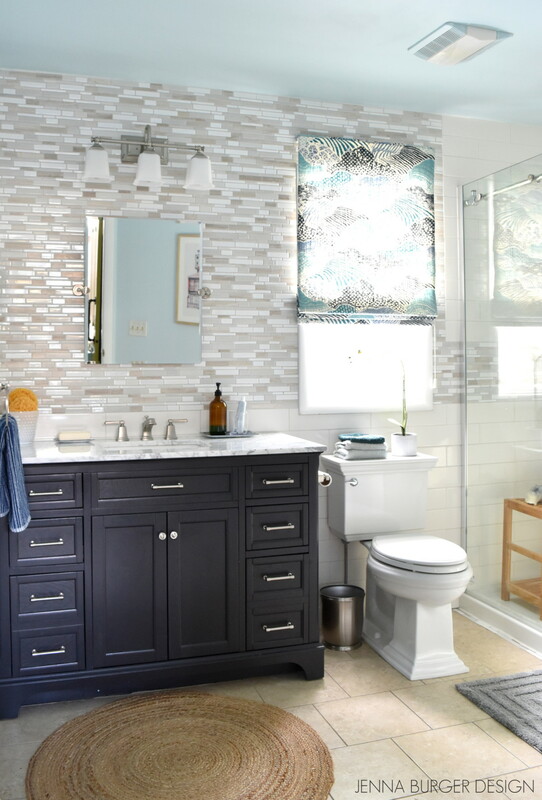 Work with a Lowe’s project specialist to design you dream space… It’s the perfect opportunity for a refresh! 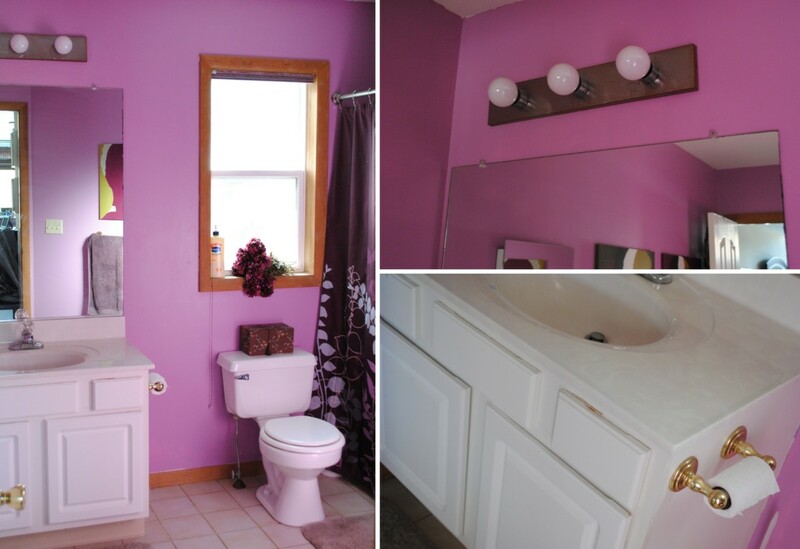 The new bathroom looks gorgeous….very nice job. 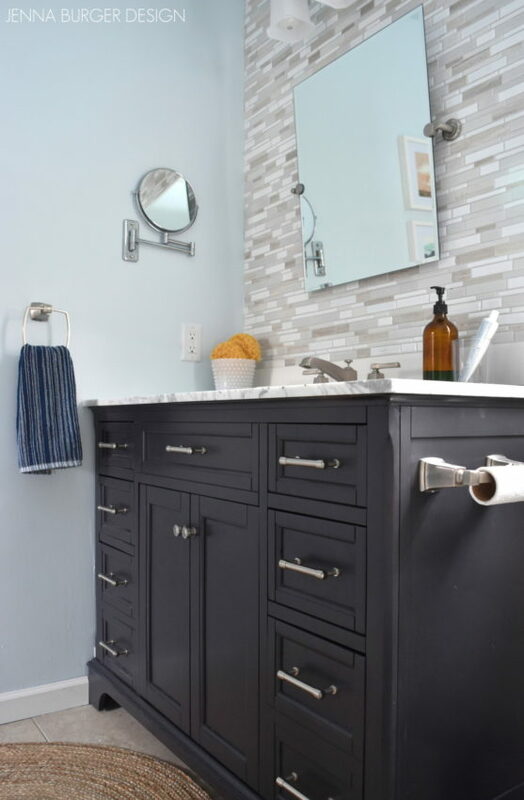 When you switched from a smaller vanity to a 48″ vanity, did you have to re-do the pipes and plumbing as well to fit the pipes through the middle of the wider vanity? We have a similar situation in our bathroom where the existing vanity is small. We have enough space to go for a bigger vanity but i don’t want to re-do any plumbing. Your insight will be helpful! When the vanity was removed, we realized that the pipes came out of the side wall, so the contractor purchased flexible tubing which he secured to the pipes in the wall and were long enough to accommodate for the additional length of the 48″ vanity. I understand you don’t want to redo plumbing, but by using flexible pipes that will tie in to your existing plumbing piping from the wall, it might be easier than you may think. Maybe consultant a contractor to see if it’s possible. Good Luck!